I don’t give things wonder product status very often – I’m fickle, and I get bored of products very, very easily. Certainly, if I can’t see results from a product within a short time, then I stop using them, and, expecially when it comes to my nails, I’m lazy, so if I have to use a product, say, more than a couple of times a week, then I’m prone to forgetting about it altogether …. However, the trio of products you see above, well, I love them! And they’ve made such a difference to my nails in a very short time, it’s almost unbelievable. Can you see the difference? 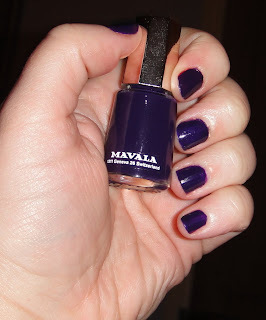 (and yes, I know this is a picture of my other hand, looooong story!) best of all, my nails are STRONG now, and don’t peel, flake or just plain snap at the drop of a hat. I’m totally in love with having nails, and I’ve been asked a couple of times if I’ve had acrylics done! It’s a three part system – but you can mix and match how many of them you need, or want to use, this is just the products I’ve found that work for me in combination, you don’t have to use all three if you think you don’t need them. 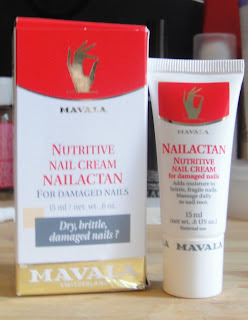 Firstly on a daily basis you use the Nailactan Nutritive Nail cream, just massage a tiny amount into your cuticles, and this keeps the nails moisturised, and prevents dryness and brittleness. I’ll be honest here and admit I don’t always use this every day, but I do use it two, maybe three times a week, and it’s very good at getting rid of dry, raggedy cuticles. It’s a very thin liquid that you paint just on the very tip of your nails – twice a week to start with, falling to once a week, or once a fortnight once your nails are up to strength – and it penetrates to bond the nail plates together and make them stronger. This tiny bottle – and it is tiny – is an entire year’s supply, but I’ve been using it for six weeks now, and as you can see, I’ve barely made a dent in the contents! This formula does contain formaldehyde, and as such, you have to be careful with how you use it – it hardens everything, including skin, so I’d recommend that you read the instructions very carefully before you use it. I’ve had no problems with it, but it is a bit whiffy, (it reminds me of sage and onion for some reason) so make sure you don’t use it in too enclosed a space. Bottle number one contains nylon strands in a strengthening base, to further support the strength of your natural nails. Once this coat is dry, you add a coat (or two) of bottle number two, which will fill in all the ridges left by the strands and leave you with a glossy base to apply polish over. 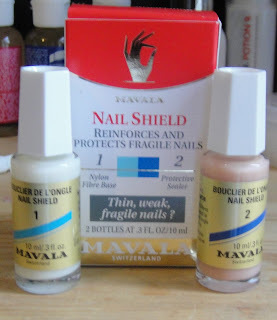 I’ve found that using these as a base both strengthens my nails and hugely improves the wear of my polishes. 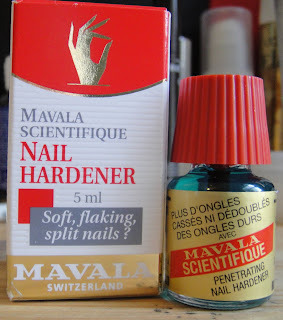 Mavala introduced Scientifique to the UK in 1959, and they say that it’s never been bettered. I think I have to agree with them. What do you use on your nails? 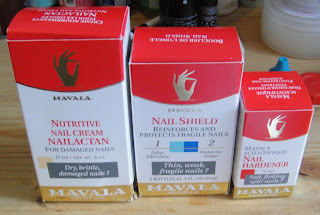 Mavala products are available at independent pharmacists nationwide, but I’ve found all these products in my local Debenhams. Products cost from around £3.75 for the varnishes, to around £10 for the treatment products. The small print – these products were provided for review purposes, but all reviews are honest regardless of the source. Previous Post Ellis Faas – the haul! I've been waiting for you to post about this! I wanted to know what you were using. Where do I buy this? 2010 must be the year I stop having horrid broken, bitten nails. ooh I love the look of this … great recommendation and something I really need..my naila are f****d! Chemists or Debenhams I've seen the products in. They're AMAZINGLY good. Must look them up and see if they're vegan friendly. I have hospital hands and hospital nails and both have a tendency to disintegrate from the constant handwashing and alcohol gel. I don't want long nails and I'm not allowed to wear nail varnish at work but it would be good if my nails didn't fall apart half way down on a weekly basis. Omg, that's such an amazing improvement! When you say local chemists, any specific ones? This kit looks like the business – I might have to invest. My nails are decidedly dilapidated at the moment. You're very welcome, let me know how you get on with it! I'm scared of getting it on my skin too, heh!